To maintain good vision and to keep your eyes healthy, it is important to have routine eye exams, even if you are not experiencing anything out of the ordinary. Some eye diseases do not have symptoms and can progress without warning. Early diagnosis and possible treatment can be key in preventing loss of vision. A routine eye examination can help detect eye conditions early and our doctors at Magruder Eye Institute will provide the best care and treatment possible. We encourage you to look through our website to learn about the different kinds of eye conditions and diseases. When preparing for your eye exam, be ready to describe any current vision problem and ask your eye doctor if your vision will be temporarily affected in case you are in need of a ride home. For those under 40 years of age with stable vision and without any eye disease, having routine eye exams every two years is important. At this exam, your eyes will be dilated so the doctor can see into your retina, your vision will be checked and you will be screened for eye diseases or disorders. If further testing is required, a more specialized exam and possible testing will be scheduled. Symptoms of current eye problems (blurred vision, flashes of light, difficulty seeing at night, temporary double vision, loss of vision, etc.). Eye injuries or eye surgeries (approximate dates, location treated). Please bring your medical insurance card, identification, all current eye drops, contact lenses and glasses you use to your appointment. It is recommended that children have an eye exam before starting school, even if not having any symptoms. Most of the time, children do not notice blurred vision as that is how they grew up seeing and may think that it is normal. If your child is experiencing any of these symptoms, request your appointment today with one of our Optometrists. Any other abnormal eye symptoms. Difficulty focusing on close or distant objects. Arms are suddenly “too short,” i.e., need to hold the newspaper or other reading material far away. Unusual difficulty adjusting to dark rooms. Unusual sensitivity to light or glare. Change in the color of the iris. Red-rimmed, encrusted, or swollen lids. Pain in or around the eyes. Dark spot at the center of their vision. Lines and straight edges appear wavy or distorted. Eyes feeling dry or tired toward the end of the day. If you are experiencing any of the symptoms above, request an eye exam. Visual acuity: Test that measures the smallest object each eye can see at a certain distance. Normally, each eye will be done individually by covering one eye at a time. The use of the Snellen chart is the most common way to test visual acuity. This chart has letters and numbers that decrease in size. Having 20/20 vision is normal. If a person has 20/40 vision, they see at twenty feet what a normal eye sees at forty feet. If someone has 20/200 vision, they see at twenty feet what a normal eye sees at two hundred feet. For children that do not know letters and numbers, they can be tested with the Tumbling E chart. To take this test, the child points his/her finger in the same direction as the E is pointing. Children who are younger than four may have trouble with this test so there are several different tests used to obtain a child’s accurate visual acuity. 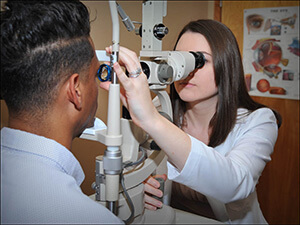 Pupil Health: Pupil testing is crucial during your comprehensive exam because careful observation may reveal neurological changes as well as information about the anterior pathways of the eye. Muscle alignment/function test: This test examines the functionality of each of the six muscles of the eye as well as checks for sources of possible double vision and check for binocular deficiencies. Peripheral Vision test: This test checks the ability of your eyes to see peripheral targets. Many eye and brain disorders can cause peripheral vision loss and can be the first sign and symptom seen. Intraocular Pressure test: Also known as tonometry, this pressure test is used to determine the risk of glaucoma. A normal pressure ranges from 8-22mmHg, Most glaucoma cases are found with pressures above 20, but in different types of glaucoma, pressure can be as little as 12. Eye pressure is unique to each person, and is used in combination of several other screening factors to determine if there is any basis for the need of more testing. Health of the entire eye: During your eye exam, your doctor will look at both the front and back of the eye. This could find causes of symptoms you have that may not be noticed or find changes in your eye that may lead to something more serious.